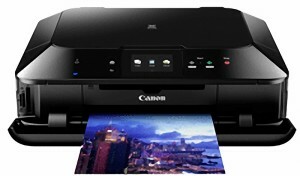 When you’re selecting Wireless Inkjet Photo All-In-One printer for your home or home office,you want a machine that’s going to offer you superior photo printing performance and incredible versatility-without cost too much!The PIXMA MG7120 may exactly what you beed.which prints gorgeous,borderless1 photos up to 8.5″ x 11″ and sharp documents with amazing quality.As good as Maximum color output at up to 9600 x 2400dpi with 1pl technology.The MG7120 comes with flexible media handling capabilities,which not only enables you to print on CDs and DVDs,but also load paper into the front of the printer as well.The beautiful 3.5″ Touchscreen LCD do a great favor for view, select and edit your images.At the same time,its Intelligent Touch System improve your productivity with beautiful backlit buttons. On the other hand,the MG7120 has six individual ink tanks,including gray ink for beautiful detail in your color and black & white photos.what’s more,it gives you lots of choices for cloud printing such as Picasa Web Albums,Flickr,Facebook,Twitter,Dropbox,and more.With PIXMA Printing Solutions (PPS),you can print and scan photos or documents from your mobile device.while built-in Wi-Fitechnology,AirPrint allows you to print directly from your iPhone?, iPad? or iPod touch wirelessly. The PIXMA MG7120 also features the convenience of Auto Power On,that makes navigating your machine automatically whenever you send a photo or document to print,While Full HD Movie Print6 turns your favorite HD movie clips captured with your compatible Canon EOS Digital SLRs or PowerShot digital cameras and VIXIA digital camcorders into beautiful prints.it’s so convenient,that you can print anytime.My Image Garden software goes with most printing features like Special Filters and Full HD Movie Print,it also helps you organize your photos with calendar view and facial recognition.In order to inspire your photo projects,it creative templates in various color combinations and patterns.Besides,when you access to CREATIVE PARK PREMIUM,you can download a lots of exclusive creative projects and content. Compatible cartridges Canon CLI-251XLY New Compatible Yellow Ink Cartridge (With Chip),Canon CLI-251XLM New Compatible Magenta Ink Cartridge,Canon CLI-251XLC New Compatible Cyan Ink Cartridge,Canon CLI-251XLBK（6448B001）New Compatible Black Ink Cartridge,Canon PGI-250XLBK New Compatible Black Ink Cartridge and more.